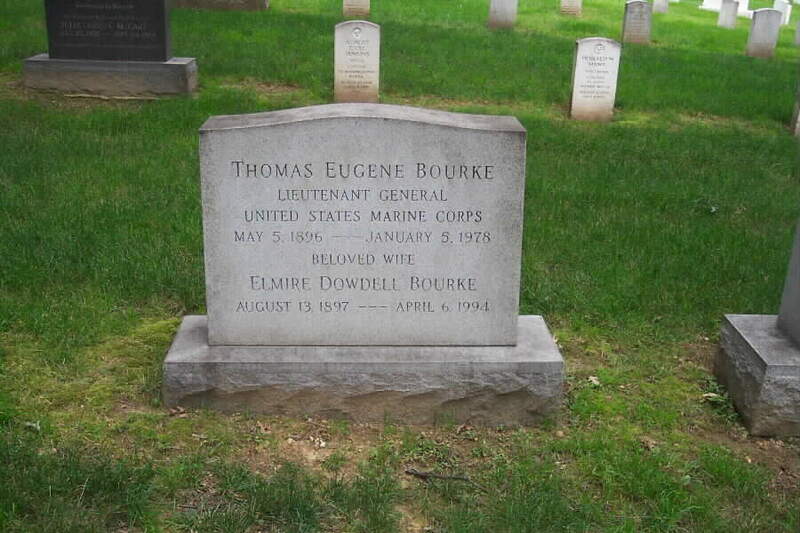 Thomas Eugene Bourke died in a Santa Clara, California, hospital. He had lived in San Diego area until last month when he moved to Los Altos. Graveside military services are scheduled for Arlington National Cemetery. 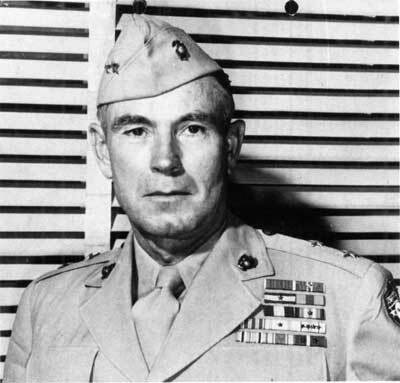 He commanded World War II Marine artillery units on Guadalcanal, Tarawa and Leyte and served as ship's gunfire and arty officer for expeditionary troops on Saipan. He retired from military service on November 1, 1946. He also commanded the 5th Marine Division in the occupation of Japan following the war. He was awarded the Legion of Merit, the Bronze Star and gold star in lieu of second Bronze Star for "meritorious service" during the war. A native of Robinson, Maryland, he was a graduate of St John's College of Annapolis, Maryland, earning a BA degree. He was commisioned a Second Lieutenant of Marines February 5, 1917. During World War I, he was stationed at the US Navy station in St Thomas, Virgin Islands. He also was 1936 graduate of the Army War College in Washington, DC. He became Deputy Commander and Inspector General of the Fleet Marine Force Pacific after the 5th Marine Division was disbanded after WWII. Following his retirement, he and wife, Elmire, settled in La Mesa-San Diego area and remained active in the real estate business from 1946 until he reached age of 65 in 1961. Served as president of Old San Diego Chamber of Commerce in 1960 and was a member of La Mesa Masonic Lodge Number 407 F&AM and Shriners. Their last residence here was in the Mission Hills area. They moved to Los Altos last month to be with son, Thomas E. Bourke, Jr. In addition to his widow and son, he is survived by 3 brothers, 4 grandchildren and 1 great-grandchild. May 5, 1896-January 9, 1978. He is buried in Section 30 of Arlington National Cemetery.